My friend Bob Garlick, marketer and half the brains behind the Bunker Project social media podcast, lent me a very interesting business book: Commitment by Olav Maassen and Chris Matt and illustrated by Chris Geary. It’s a business book… that’s also a comic book, a graphic novel! Comics have always fascinated me – in fact, I’m a board member and regular contributor to Cloudscape Comics. Furthermore, in my role as a content writer, I’m always interested in finding exciting ways to tell my clients’ stories. As I mentioned in my Corporate Comics presentation, a comic’s combination of text and images really engages readers, making the driest material compelling. You can use a comic to lay out the story of a company, the story of a product, an overview of its methods, or the effectiveness of a process. People want to read the whole thing and they remember what they’ve read. Commitment explores the ideas of risk management and real options – how an individual or organization can overcome business challenges by creatively re-examining the options available to them. However, it’s also the story of Rose Randall, a shy young woman who finds herself in charge of one of her company’s projects, a project that will fail unless she reorganizes the team and their methods in a way that her bosses don’t expect. By using real options, Rose is able to successfully complete the project, proving to her bosses and herself that she has what it takes to succeed. When I was first told about this book, I expected something like Scott McCloud’s Understanding Comics, a comic used to explain content but with no over-arching narrative. I was pleasantly surprised to watch Rose’s story entwine with the various business lessons. Almost all of us know what it’s like to be thrown into a situation we feel ill-prepared for, one that is above what we believe to be our level of ability, and so we sympathize with Rose’s situation and are excited to learn how she uses the business lessons to survive and thrive in her new environment. The story & art take what could otherwise be a dry business book and transform it into a vibrant narrative which we eagerly explore and through exploring learn its lessons. Commitment shows the effectiveness of using a graphic novel to describe business ideas and I hope that other business authors will follow the example of these creators in explaining their own ideas through this powerful medium. 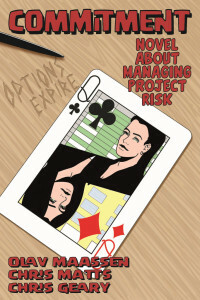 This entry was posted in Review and tagged Bob Garlick, business book, Commitment, corporate comic, graphic novel. Bookmark the permalink.